Heyford Bowls club was founded in 1991, initially to play the Short Mat format in the Village Hall and this continues to the present day with sessions on Wednesday afternoons and evenings. From the outset, however it had been the intention to create an outdoor green on Heyford Playing Fields. 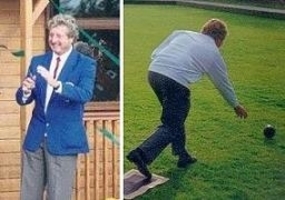 A successful lottery bid meant that work could start in June 1996, and the green was opened officially in October of that year by world famous England international bowler Tony Allcock MBE. The first outdoor season began in May 1997. Further lottery funding in 2013 enabled us to construct changing rooms - the envy of many clubs because of their roominess and facilities - and the following year a band of volunteer workers extended the clubhouse. The Short Mat bowlers bowl throughout the year, their sessions on Wednesdays largely being roll-ups, they only occasionally have a match against a visiting club, but the internal competitions are hotly contested. The Outdoor season lasts from April to September, with a full friendly fixture list against other clubs, sides made up of both men and women. In addition the ladies have their own midweek fixtures - about 12 - while the men have their Monday Night Northamptonshire Area Triples League. As with the Short mat section, internal competitions are keenly fought. Friday night is a fun club night and that’s the night to come along if you want to try a sport that we are so enthusiastic about. Bowls has poor publicity, being regarded as “old men’s marbles”, but let me remind you that it is one of the few sports that men and women can play on an equal footing, and one of the best bowlers we have in this county is under 25, so don’t leave it too late to try it. Check out the news pages for the latest reports.